It’s been a long dry spell since I imaged. I think I made an attempt a few months ago in early May and just didn’t have any decent results… before that, it was January. While we just finished a stretch of poor weather surrounding the hurricane, the skies, albeit moon-filled, were clear last night. So, with cool air and an idea, I set out to image the Heart and Soul nebulae together in a 200-ish mm focal length with one of my DSLR lenses. I’d like to try and recreate the pair imaged in narrowband with those nice blue and gold hues that I find so elusive in post. When I was set up and polar aligned, I realized that the targets would be behind some tall pine trees for another couple of hours… comes with the territory living in the piney woods of east Texas. I didn’t want to simply wait it out without any production what-so-ever, so I started mentally running through other larger targets that might be suitable for that focal length and that were also high enough above the horizon to get a clear field of view. I’ve done a really wide run at the North American Nebula before (I think it was about 70mm), but why not practice on it again with a different framing, right? So I spent the hour or so before its transit gathering hydrogen-alpha data in 10 minute un-binned subs. I thought 10 minutes would be safe given the significantly lighter loading on the mount with no telescope, but being extended near the meridian flip caused some tracking issues that resulted in rice-y stars. After the flip, I got about 10 or so subs each of OIII and SII (binned 2×2 for signal) before imaging some new Ha subs with better star shape. I ended up using all the Ha anyway (minus one with a pine treetop in frame), but I’m sure the image could be marginally improved by throwing away everything before the transit. I am still not where I want to be on the colors/hues in my Hubble palette attempts, but I’m getting closer. I ended up sticking with NGC 7000 the rest of the run and decided to save the Heart and Soul project for another day (night). What am I looking at here? Well, all this stuff is in Cygnus. Cygnus (the swan) is a large northern constellation that is in the plane of our Milky Way… meaning, when you are somewhere dark and can see the milky-band of our galaxy, it’s in that stuff. The most prominent target in this image is NGC 7000 – which is commonly known as the “Norht American nebula” due to its pseudo-resemblance to the North American continent. The little section that would be where the Gulf of Mexico coast of Texas is in the nebula is one of the most photographed parts of the entire contellation… it is known as “the Cygnus Wall”. Next to the North American nebula is IC 5070 – the Pelican Nebula. Both the North America nebula and the Pelican Nebula are emission nebula and active star-forming regions. 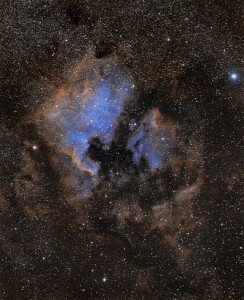 The North American Nebula is approximately 520 parsecs (1,700 light-years) from the Sun. It has a diameter of about 100 light-years and a total mass equal to about 4,000 solar masses. It is so large that it is viewable with the naked eye from some of the darkest places on Earth. The region of Cygnus shown in this image is packed full of all sorts of other stuff, but those are the two most well-known characters.